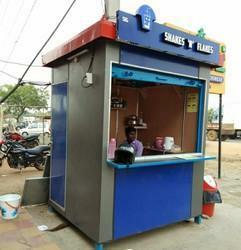 Leading Manufacturer of acp cafe cabin hyderabad and ms portable shop cabin from Hyderabad. We have emerged as one of the most experienced and well-developed companies in the production of Farm House. 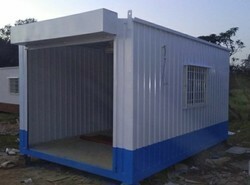 Our clients can avail from us an extensive range of superior quality Prefabricated Farm Houses. Widely known for excellent accommodation and sturdiness, our offered houses are built using top-notch components. These houses are designed as per the defined industry standards by our highly qualified professionals using the excellent quality raw materials. AM Office solutions are known for their sophisticated design, unique pattern and fine finish. To ensure its unique design and easy installation, our constructed farmhouses are well tested against various quality parameters by our quality experts. Further, our esteemed clients can avail Farmhouses as per their varied needs at the most affordable price within the stipulated time frame. Our designed Farmhouses are easy to relocate and highly secured. The construction material is selected to provide optimum strength. Elegantly textured with long-lasting glass fibre wall panels. For stability and strength, Stainless steel structural framework is used which can withstand any weather conditions. These Farmhouses are Maintenance free, Dust Proof doors, Windows with SS mesh & Grills. In addition to the constructional features, we also equip the farmhouses with ISI marked concealed electrification & plumbing. Looking for Portable Shop Cabin ?